Athletes and body builders use Anastrozole by Balkan Pharmaceuticals as a part of their steroid cycle to reduce and prevent symptoms of excess estrogens like gynecomastia and water retention. Anastrozol lowers serum estradiol concentrations and has no detectable effect on formation of adrenal corticosteroids or aldosterone. 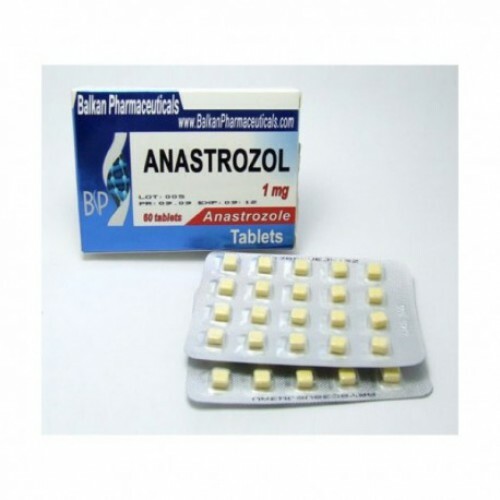 Anastrozol 1mg can be stacked with such drugs as Dianabol or Testosterone to combat and bock gynecomastia and water retention. Average dosage: 0.5 to 1 mg daily. Anastrozole has a short active life and the dosages are usually taken from two to six times a day at equal intervals.